KidZania was a mystery to me until last Sunday. 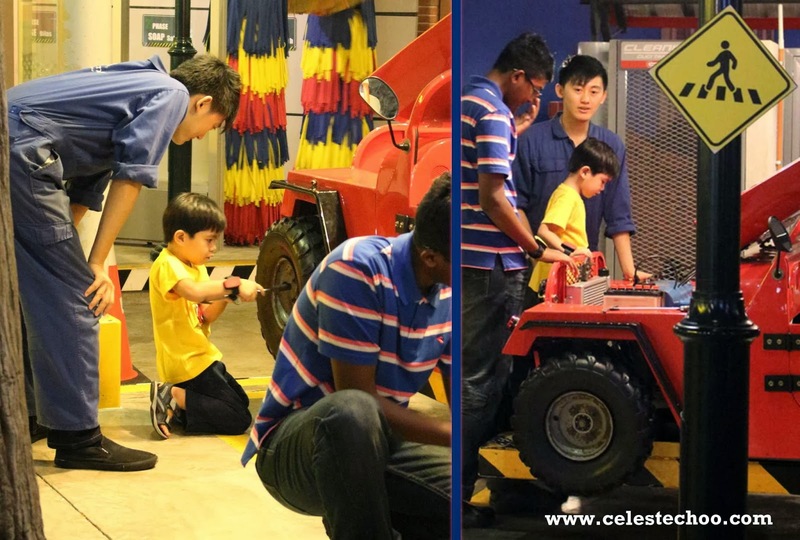 Although I’ve heard of it several times and meet kids who go ‘gaga’ over the mention of KidZania, I didn’t really have the time to explore what this place is about, and moreover, my son was only 2 years old when KidZania first arrived in Malaysia. Oh, how fast time flies! 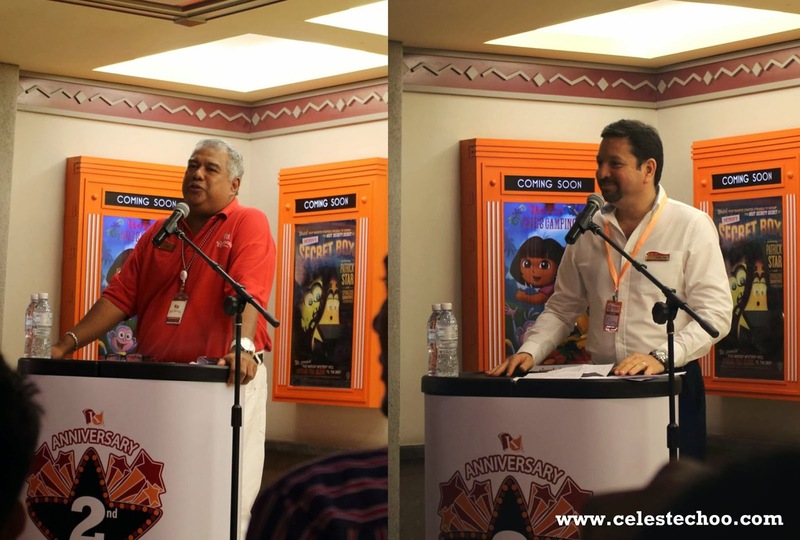 KidZania KL, award-winning indoor family edutainment centre, just celebrated its second anniversary with its industry partners, children and parents in a day that proved that ‘All Good Things Come in 2s’! Now my son is already 4 years old and I was just delighted to be part of KidZania’s celebration together with him. At this age, he will have a better understanding of what to do in this play land. For those who also find KidZania a new concept, KidZania is an indoor city where children can engage into different activities that simulate real life professions such as fire fighter, baker, chef, radio DJ, dentist, policemen, postman and more. Entering KidZania for the first time, I was welcomed by flights of escalators that lead up to the edutainment area that is beaming with happy children all around. I actually didn’t know where to start. 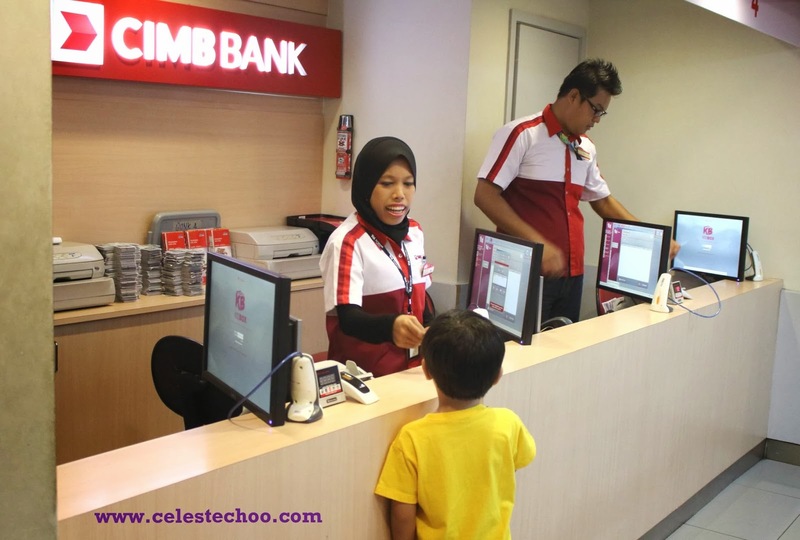 Luckily, a helpful staff informed me that I need to encash the cheque at CIMB bank. 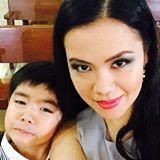 So my naughty son and I headed to CIMB. 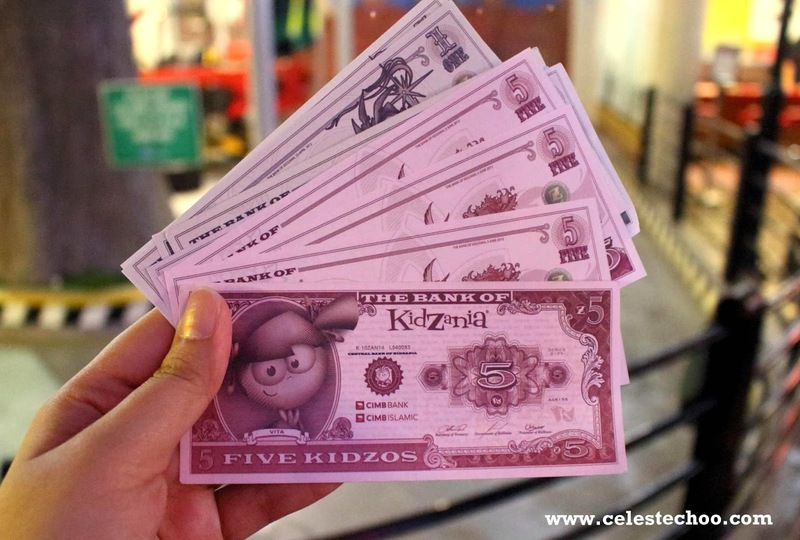 My son was given this stack of paper money, or what KidZania refers to as KidZos. 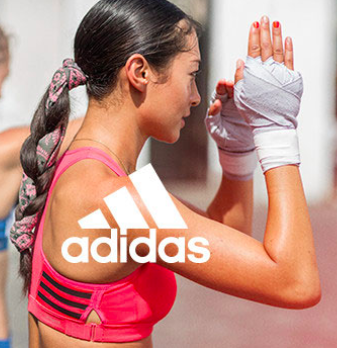 The KidZos are to be used to pay for some of the activities while some activities allow children to earn money. It’s a great way to educate children about real life, and how they will eventually need to work on their own to have money for things they want to do or buy. 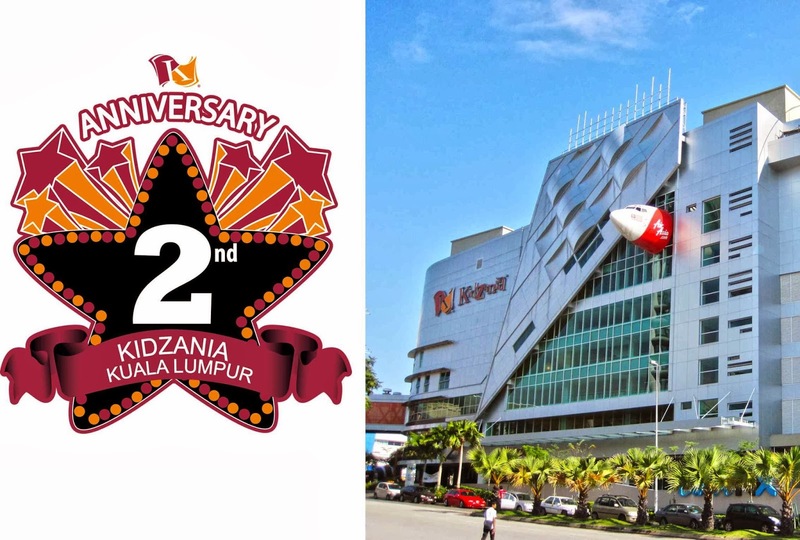 In conjunction with KidZania’s 2nd anniversary, the first 200 hundred visitors were given free entry, with subsequent visitors receiving 40% off regular ticket prices. There were special performances by the Beaming Strings Ensemble and the KidZania Kuala Lumpur Artistic Percussionists, as well as 200 party packs that included popcorn and exclusive merchandise for kids who turned up at the park at 2:00pm, kept the party going. The second anniversary celebrations were presided over by the Governor of KidZania Malaysia, Yang Mulia Tunku Dato’ Ahmad Burhanuddin, who is also the Managing Director and Chief Executive Officer of Themed Attractions and Resorts Sdn Bhd, Mr Andrés Fabre, Chief Operating Officer of KidZania Central Government, with En Mohd Daud Mohd Arif, Secretary of Industry Development Division, Ministry of Tourism and Culture, Malaysia (MOTAC) and Tuan Haji Zainuddin Abas, Director of Co-Curriculum and Arts Division, Ministry of Education, Malaysia. 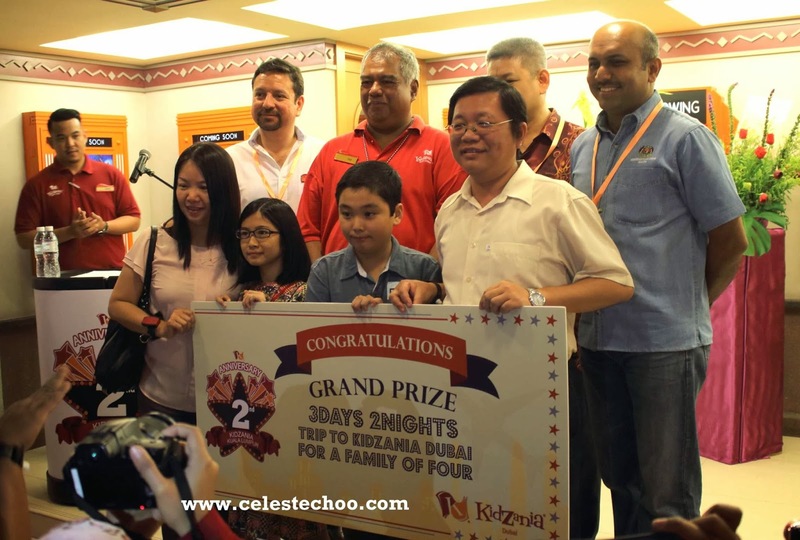 KidZania KL also held a video contest and the winners were announced that day. The grand prize winners, eleven year old Emily Gunn Shian Mum of Petaling Jaya and eleven year old Lau Hau Shien of Klang, each received an all-expenses paid vacation for a family of four to KidZania Dubai, worth RM25,000. Wow! 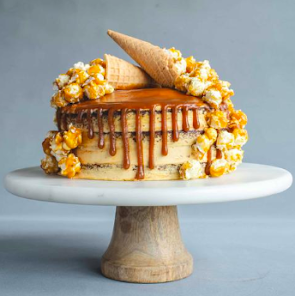 The ceremony was marked with lighting of several cakes. 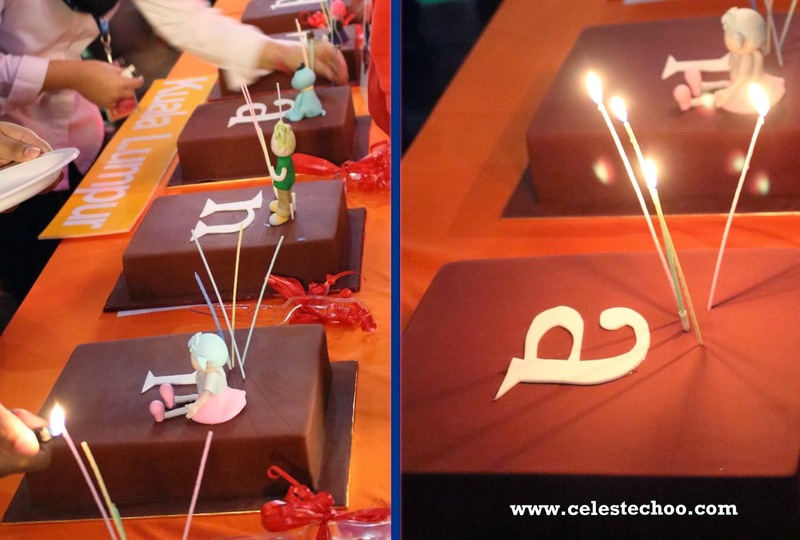 Each letter from “KidZania” had 1 rectangular cake and the guests of honor lighted the cakes. This was followed by a dance performance of KidZania’s mascots that mesmerized the kids including my son. 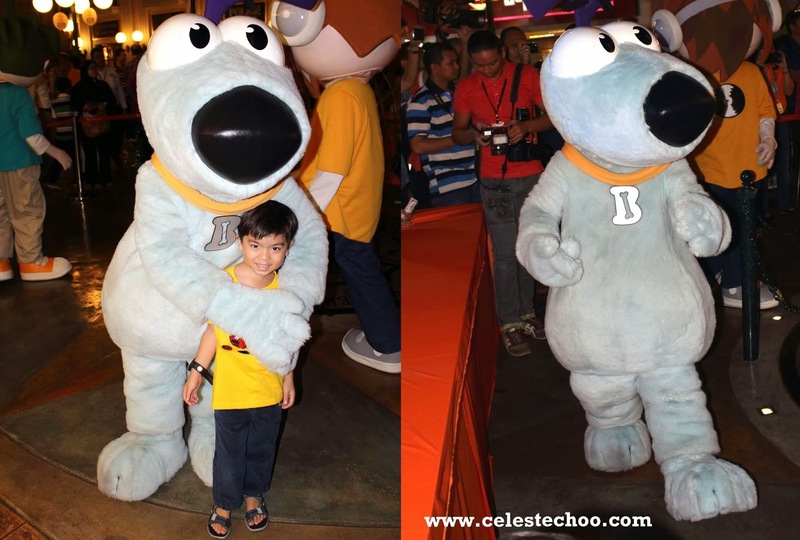 He particularly liked Bache, a cute dog in light blue. I rarely get a chance to take a photo of him with a mascot because he doesn’t want to. But he really liked Bache. 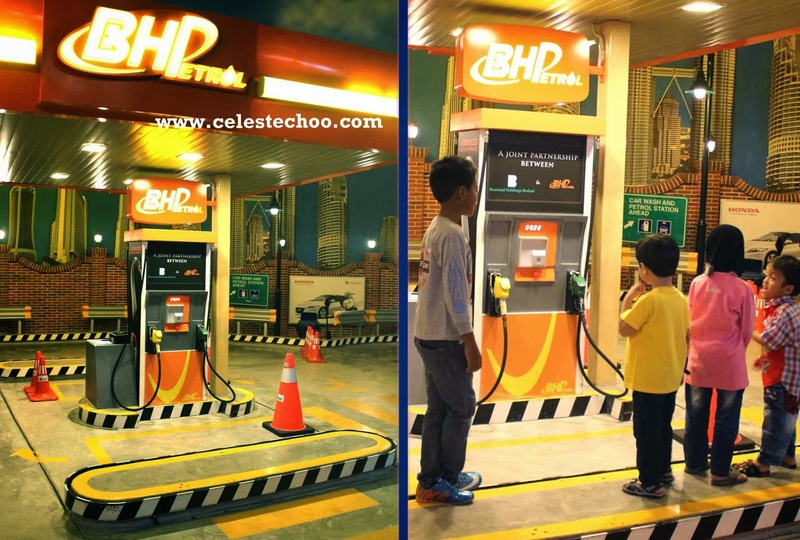 After the ceremonies, the first thing he tried was the BHP petrol station. Yes, like a lot of young boys, my son has this special attraction to things that involve cars, train or anything with wheels. After performing the activity, the children were given several KidZos. So this is actually a “money-making” activity where they can earn. Good stuff. Then he tried the auto repair shop, of course, because it involved wheels! He was so engrossed with removing tires from the red car. He actually did this activity a few times! He also tried a few other things such as baking a cupcake at Ayam Brand and he wanted to be a firefighter. However, the queue to the firefighter center was very long and my son cannot wait. But he had a blast with the auto repair shop so he’s happy. 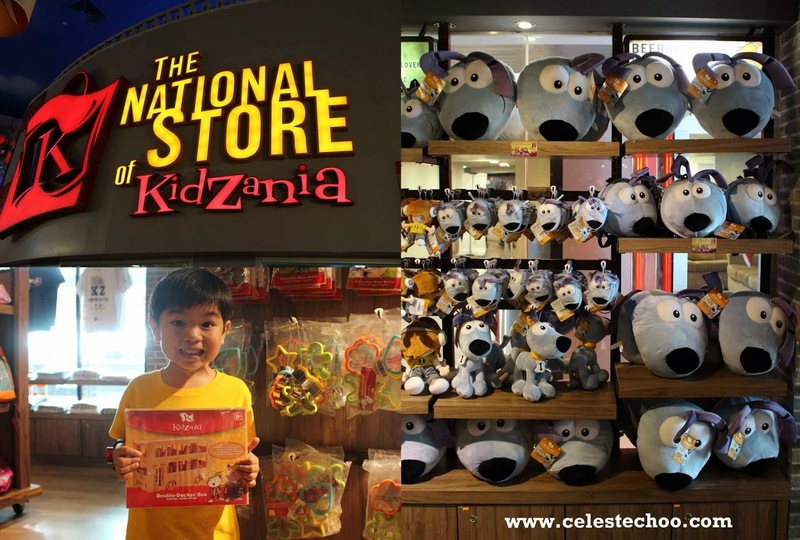 We also visited the National Store of Kidzania where cool merchandise are for sale. See those adorable Bache stuff? But my son’s addiction to wheels prevailed. He picked a DIY wooden puzzle figure of a double-decker bus. The place is truly a haven for children and even parents. I’m sure it will be a delight for other parents, too, to see their kids engaging in simulation of careers that encourages children to think ahead. 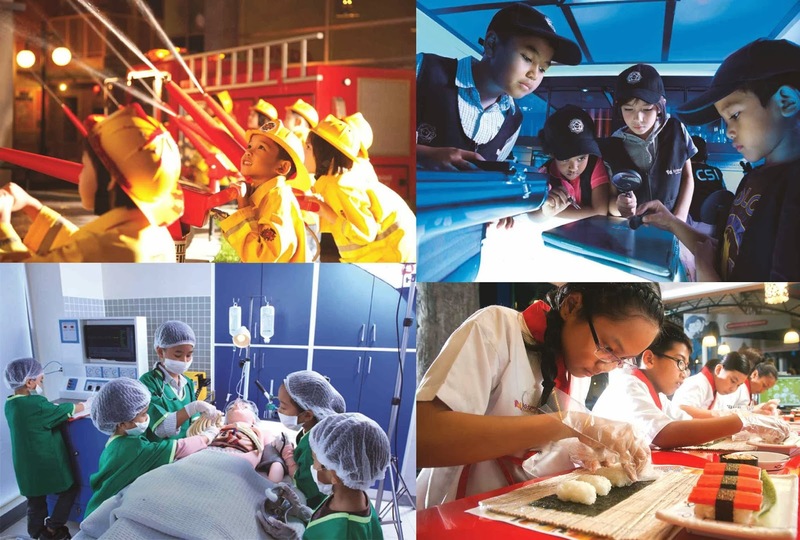 New activities are regularly introduced at KidZania Kuala Lumpur as new industry partners become part of the children's city, giving young visitors more edutainment experiences and exposure to real-life professions. In 2013, 43 industry partners joined KidZania Kuala Lumpur. 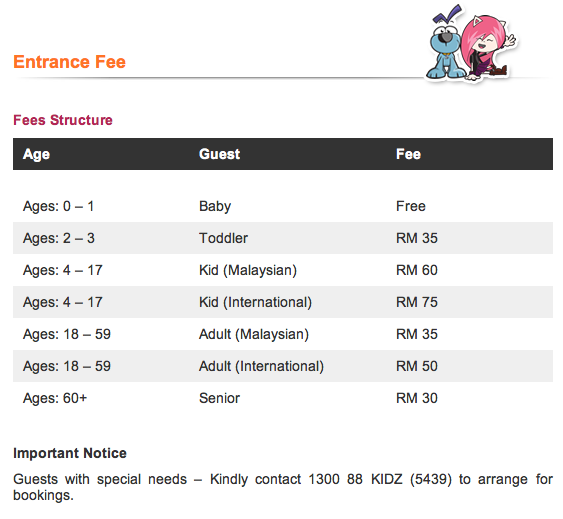 So should you bring your kids to KidZania? If they’re above 4, YES! They will definitely have a good time and will easily spend hours of engaging in educational activities. Who knows, this can be a small step towards their mission of becoming a doctor, dentist, engineer or chef one day. KidZania is an indoor family education and entertainment centre, which offers an interactive learning and entertainment experience targeted at kids aged 4 to 14 years. KidZania combines role-play with real life, creating a kid-centric city experience designed to educate and inspire kids; from arriving at the airport, to visiting a city centre to exploring the city streets. As in the real world, kids choose activities – such as being a police officer, doctor, journalist or a customer – and earn money, which they can then spend or save. KidZania operates just like a real city complete with buildings, paved streets, vehicles, a functioning economy, and recognisable destinations in the form of “establishments” sponsored and branded by leading international and local brands. The facilities are designed to educate through experience, fostering the development of life skills, but from a kid’s perspective it is all about fun. Essentially the fastest growing educational and entertainment brand in the world, KidZania has won numerous awards, having been voted “Best Theme Park Worldwide” by The Themed Entertainment Association, “Top Family Entertainment Centre of the World” by the International Association of Amusement Parks & Attractions (“IAAPA”), “Global Leisure Operator of the Year” by Retail and Leisure International and “Concept of the Year” by MAPIC. Recently, KidZania Kuala Lumpur won the “Best Experience for Kids” at the Best of Malaysia Awards (BOMA) 2013 and the Bronze Award for the “Best Online Driver” category for its Kids for a Greener World campaign at the Marketing Events Awards 2013. About Themed Attractions and Resorts Sdn. Bhd. Themed Attractions and Resorts Sdn. 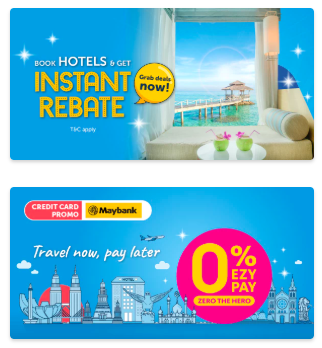 Bhd., a wholly-owned subsidiary of the Malaysian Government’s investment arm, Khazanah Nasional Berhad, was incorporated in June 2009 to develop, manage and operate theme parks and attractions in Malaysia, serving as a catalyst for the leisure and tourism industry and bringing premier international theme parks and attractions to the region. The theme parks include KidZania Kuala Lumpur, an indoor family education and entertainment centre, which offers an interactive learning and entertainment experience; LEGOLAND® Malaysia Resort - the sixth LEGOLAND to be built in the world and the very first in Asia; SANRIO HELLO KITTY TOWN, the first of its kind outside of Japan; The Little Big Club, a single themed attraction that is home to five popular global characters; and LAT’s Place, a themed restaurant with live animation based on the popular Kampung Boy (Village Boy) character by famous local cartoonist, LAT. Themed Attractions will also develop, manage and operate KidZania Singapore.